Josephine Mbinya bends from the waist to pluck beans from the black soil on her smallholding south of Nairobi, Kenya’s capital. She throws them in a heap on the side of the field. 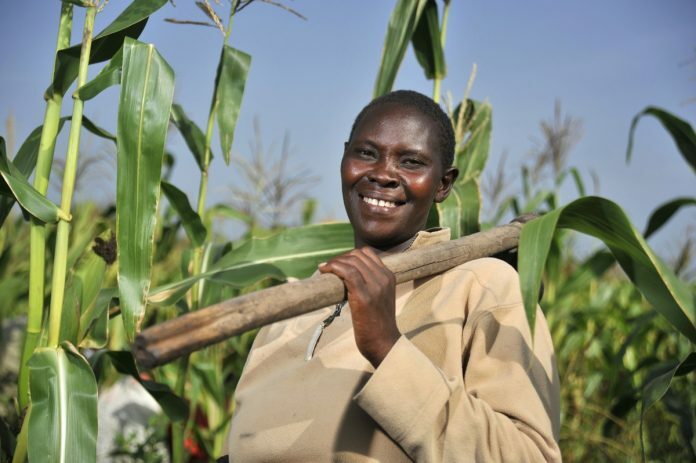 Like many of the 80 percent of Africa’s farmers who operate on less than two hectares (five acres) of land, Mbinya struggles with a lack of financing, proper irrigation, fertilizer and machinery. Land-ownership restrictions in some countries also discourages large and small-scale farming alike. With food production in other parts of the world approaching its limits, overcoming those constraints will prove critical to feeding a global population that the United Nations anticipates will balloon to 9.7 billion by 2050, from 7.3 billion. While World Bank data shows agricultural production on the continent expanded 4.2 percent in 2014, up from an average of 2.3 percent a year in the 1980s, that’s still shy of a 6 percent annual growth target set by African leaders in 2003. Average crop yields in Africa remain less than half of the global average. In the case of corn, productivity gains have been marginal, lagging other continents. Despite having about 60 percent of the world’s uncultivated arable land, the continent spends about $40 billion annually on food imports, according to the Alliance for a Green Revolution in Africa, or Agra, a Nairobi-based non-profit that assists small farmers. “Political will to improve agricultural development is increasing, but not yet at the needed levels,’’ Joachim von Braun, an agricultural economist at the University of Bonn, who sits on Agra’s board, said by e-mail. African countries will need to increase mechanization, spend more on rural roads and other infrastructure and improve farmers’ access to financing, training and land rights, he said. Even with increased access to fertilizer and irrigation, there are limits to what small farmers will be able to grow, and African countries will need to lure more foreign investment to ramp up mechanized food production, according to Ernst Janovsky, the head of agribusiness at Barclays Africa. He sees curbs on foreign land ownership in many countries as the biggest deterrent to attracting foreign capital. Duncan Vink, the joint managing director of UFF Agri Asset Management, which advises insurer Old Mutual Plc on its agricultural investment funds in Africa, still sees the continent as alive with potential. UFF targets annual returns that are 10 percent more than the inflation rate on farms the funds buy and lease out. African countries can learn lessons from Brazil, which has a similar climate, topography and soil as parts of Africa. It turned itself into a farming superpower over more than four decades by implementing an integrated plan to raise productivity, according to PricewaterhouseCoopers LLP. Key to its success was the enactment of government reforms that improved the investment climate and allowed the private sector to flourish, the accounting firm said in a report released in December last year. Nick Vink, a professor of agricultural economics at the University of Stellenbosch near Cape Town, said rising food demand is already spurring increased investment and the adoption of more efficient farming methods. One perennial problem is set to dog African farmers regardless of policy or technological advances: having too much or too little water. Early last year, tens of thousands of hectares of farmland across Malawi, Mozambique, Madagascar, Zimbabwe and Zambia were swamped by floods caused by torrential rains. Now the worst drought in more than a century is devastating crops across southern and eastern Africa, leaving millions of people at risk of of going hungry. Zimbabwe, South Africa, Somalia and Ethiopia are among the worst-affected countries. For Mbinya, whose smallholding yields 13 crates of tomatoes, 1.4 metric tons of corn and nine sacks of beans in good years, favorable weather is the key to feeding her family. “When there is enough rain we are happy because we know we will get a good harvest,” she said.